WHAT’S INSIDE Welcome to your new Back Pages. It’s always encouraging to hear how God is at work in the world of sport and this issue shares some great examples from around the globe. 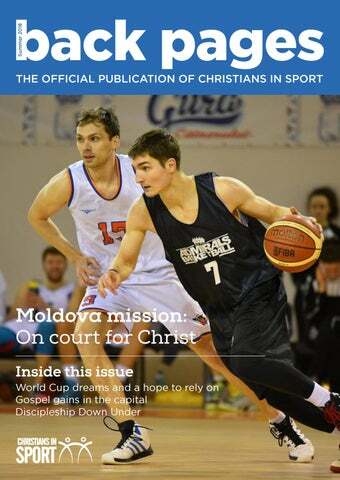 From Moldova to Australia and across the UK, sportspeople are hearing the gospel and that’s worth celebrating! “The gospel is bearing fruit and growing throughout the whole world – just as it has been doing among you since the day you heard it and truly understood God’s grace.” Colossians 1 v 6 (NIV) Paul wrote these words to the Colossians almost 2,000 years ago. They were as true back then as they are today - the gospel is bearing fruit and growing throughout the whole world. Paul saw amazing gospel growth as he preached the message of Jesus across much of the Roman Empire. But living now, we can see how much further the good news has spread and rejoice in that fact. If you are a follower of Jesus in the UK today, you are living proof of this. In this magazine, we have some have great examples of how the gospel is bearing fruit in the world of sport beyond these shores. Jules Wilkinson and I had the privilege of being part of the chaplaincy team at 2018 Commonwealth Games where we saw how God’s word is taking root among top-level athletes from across the globe. Being part of a global sporting event like that gives a great focus to our work of supporting elite sportspeople all year round. I hope you will also be encouraged by how God is at work in Moldova. You can read how members of the Admirals Basketball Academy are hearing the gospel as they train and compete together. Two of the men behind this vision, Eugene Postolache and Eugene Pogorelov, themselves came to faith in Jesus through a sports mission initiative and were further equipped to reach local sportspeople after attending a Sports Plus camp. Also happening this summer, there are few, if any, bigger global sporting events than the World Cup. Let’s be praying for more doors to be opened to the gospel in international football. But let’s also remember what an opportunity the World Cup presents to share the good news with our sports friends locally. The gospel is still bearing fruit and we can be part of that great mission today! BACK PAGES BITE-SIZED Christian sportspeople are sharing their faith with their friends all over the country. Here’s a collection of stories to encourage and inspire you. A few months ago, I was invited to a Christian in Sport Sports Quiz and encouraged to bring a group from my cricket team. This also happened to include a couple of my best mates. None of the team were church goers or have ever expressed an interest in faith. I found it so easy inviting the team to the quiz considering I’ve never invited them to church before, they all were keen and some even brought their girlfriends. They were able to hear the gospel throughout the evening and I got to share why Jesus is so important in my life. We won the quiz and they all can’t wait for the next one. Initially we hosted a Dialogue Dinner style ‘pasta party’ to discuss the Christian faith with our athletics friends. Thirty came, engaging with discussion and asking thoughtful questions. We covered the relevance of Jesus’ life, death and resurrection. Every week since we’ve done a Bible study with a smaller group who are interested. Around 10 who are investigating faith regularly attend and even invite other friends themselves. We started with an Uncover study of John and when our friends were keen to carry on, we looked into Old Testament stories. Their Bible knowledge has grown dramatically, making many links and comparisons between stories themselves. â&#x20AC;&#x153;This is what I love. This is my passion.â&#x20AC;? That is how Eugene Postolache describes his work for the Admirals Basketball Academy in Chisinau, Moldova. Eugene, and his colleague Eugene Pogorelov, are examples of the amazing work Admirals do. Both came through the basketball programme and are now on staff, coaching various teams and sharing the gospel with them. the Basketball Federation of Moldova to take a team to Ukraine for a tournament. After starting out with one team, they now have four sides, with players of both sexes representing Moldova in national age group teams. Yet throughout the Admirals’ evolution and development, the vision has always remained the same: to share the good news of Jesus with all those who attend the academy. Both Eugenes know personally the role sport can play in a person’s journey to faith. For Eugene Pogorelov it was after attending a sports camp at 17 that he made a commitment to follow Christ. Whilst for Postolache, he was challenged to investigate Christianity for himself after hearing the gospel from an American basketball coach whilst at university. Consequently, they are both passionate about their work as they share their basketball expertise, their lives, and the gospel with the young players they coach. It has been our privilege to support the Admirals over the years, through training leaders, speaking at events and helping provide teams for camps. In 2015, when the Admirals were looking to start a basketball camp, both Eugenes came over to Repton Sports Plus to see a camp model in action. For Postolache, the opportunity to visit Repton was a defining moment: “I came to Sports Plus two months after I joined the Admirals. It was a crucial time for me. “After the camp this year, two of them made a decision to follow Christ, but for a few months before, we had slowly started to study the Bible. Since the camp, we have been holding Bible studies two mornings a week. And we can see that they are progressing in their faith.” It is a picture of what the Admirals are seeking to do - investing long-term in the lives of these young people and helping to develop committed disciples of Christ who, in turn, will go on to make more disciples themselves. Sports Plus, has translated well to a Eurasian context! Visits have been reciprocated with Christians in Sport staff and Interns travelling to Moldova to deliver some of the teaching at their ‘Born to Play’ training camps over the past four years. 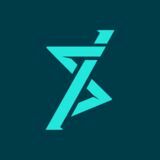 The most recent edition was in January 2018 and it saw around 50 young people (all aged between 13 and 16) spend three days playing sport, undertaking team building exercises and looking at the central truths of the gospel. At the end of the training camp, many of the young people made a commitment to follow Christ. But the Eugenes are keen to emphasise that the camps are no standalone venture, rather they are just one part of the Admirals’ ministry. “We are trying to tell them the message of Jesus Christ all year round. Born to Play is just an opportunity for them to move the knowledge they have from the head to the heart,” said Pogorelov. They highlighted two young players who became Christians back in January. And what of plans for the future? Last month saw the introduction of a leadership training programme that aims to develop broader life skills that should serve the 36 attendees into adulthood. “We want to help them use their abilities and their potential, and teach them different life skills, but also, during that time, share the great story of Jesus. We understand that this is a process, it is not just one or two meetings, it is a process lasting maybe five years.” This story is one example of the many great ministries across Europe and the world which we are supporting over our next three-year strategic Game Plan. We continue to pray on for all the Lord will do through the Admirals Basketball Academy and pray expectantly for more examples of sports mission across Europe. WORLD CUP DREAMS AND A HOPE TO RELY ON As you read this article, the World Cup is in full swing. One of the biggest sporting events on the planet has fans gripped as 32 nations compete for the coveted trophy in Russia. When you consider the global interest the World Cup generates as well as the joy and celebration it can elicit, it is easy to see why football is widely known as the beautiful game. ‘elpis’ confidence is now lost. But what happens next is awesome. Jesus says how foolish these men had been not to believe what was written about Him in the scriptures and after giving them the most amazing Bible study and breaking bread with them, Luke tells us: “their eyes were opened and they recognised Him”. Suddenly, their hope, which had turned to despair, is restored and they powerwalk it back to Jerusalem to let the disciples know Jesus is alive. That is the difference Jesus makes. He provides the hope we can be confident in. The writer to the Hebrews sums it up pretty well in chapter 11 v 1 (NIV): “Now faith is confidence in what we hope for and assurance about what we do not see”. There is nothing wrong with having optimism as a football fan. And as an England supporter, I would love to see them lift the trophy on 15th July, but there is no certainty in this outcome. Let’s enjoy the World Cup, but rejoice in the ‘elpis’ hope found only in Jesus. LONDON CALLING: GOSPEL GAINS IN THE CAPITAL By 2020, we aim to see the gospel reaching sportspeople in 121 cities and towns across the UK. With a population of 8.8 million, London is one of the places we’re particularly focussing on. Dundonald Church in Raynes Park, near Wimbledon, is part of the Co-Mission network of churches in the capital. Ministry Trainee Pete Greene, a golfer and cricketer, helped set up Dundonald’s Sports Network with rugby player and Christians in Sport Intern Jos Edwards after attending our London gathering. The UK’s capital is certainly a sporty city, with 40 per cent of Londoners taking part in two or three sessions of physical activity a week. But fewer of these are playing sport in traditional clubs and teams. For example, running groups meet regularly in most of the city’s parks and others play football or rugby in workbased teams, while much of this happens away from ‘traditional’ weekend matches. “About 30 people are involved. We’ve created a WhatsApp group as a way to stay in contact if we can’t always make the face-to-face meeting.” During the Six Nations rugby tournament, the church hosted a barbecue and showed the England versus Ireland match on a big screen. Around 100 people came and they kicked off with a gospel talk. A few miles north, a group has also started at The Boathouse Church in Putney, another Co-mission church, which has around 50 adult members. While lots of the group are part of clubs and teams, others play sport on a more ad-hoc basis, like so many of their fellow Londoners. Touch rugby player and paddle boarder Beth Cutting said hearing about the vision of Christians in Sport had spurred members into action. “This got lots of us really excited, seeing there was a mission field out there and asking each other ‘what are we going to do about it in Putney?’ “After that, we did a survey to find out how many people in the church were playing sport. It showed 40% of our adults were engaged in regular physical activity. All of them were interested in meeting together to pray about their different sporting contexts. Since September, we’ve been meeting once a month for breakfast before our Sunday morning service to pray and share something from the Bible. We’ve even had three people join clubs due to the encouragement of the group when they hadn’t felt confident enough before.” The church used one of their monthly Boathouse Session outreach events to host a Sports Quiz, while group members are looking for more training to help with one-to-one evangelism. Over in south east London, staff member Linvoy Primus has helped Christ Church Bromley set up a monthly Bible study for local professional footballers. Matt Lloyd, the church’s associate minister for evangelism, said: “We had one footballer in our church already and Linvoy linked us up with another two. Linvoy leads the Bible study and I help. They are all Christians at the moment and it’s in early stages, but we’re praying for gospel opportunities with teammates. “One of the best things about it is that they are meeting guys who live in their world. One of them said ‘It’s the highlight of my week. We talk about football and what it’s like to be a Christian in the changing room’. I would say that he’s grown considerably in faith through this relationship with the other footballers. I couldn’t have set this up without Christians in Sport. It’s a great example of serving the local church.” Matt, who plays wheelchair tennis, said the church are also thinking about other ways they can reach out to their local sporting community. Having seen something of what’s happening in London, how could you get stuck into your local world of sport? able to hold a gathering before the competition started for any Christians who wanted to come. It was wonderful to see a number from different countries meeting as sisters in Christ the day before they were competing as hard as they could against each other.” Graham added: “Sometimes teams wanted a Bible study and we were able to provide that too.” The Games, however, were not without their funny moments. Graham said: “Everyone had their uniform. Ours was yellow and made us look a bit like pizza delivery people, which led to a lot of banter, but fortunately our takeaway services were never called upon!” One of the roles of chaplains is to provide a safe space for people to be quiet and to offer expertise and support when tragedy strikes. This proved the case after 15 players and staff from the Humboldt Broncos ice hockey team were killed in a road accident. provision they make for chaplaincy. Most will look to have representation from the five majority world religions. At Gold Coast 2018, the Christian chaplains were based in the Multi-faith Centre in the middle of the Athletes Village. Reflecting on the Games, Jules and Graham were able to praise God for many highlights. A big encouragement was the relationships that Graham and Jules were able to develop with officials. “It’s not just the athletes that are under pressure, but the team managers too, so it’s important that they trust what we’re doing,” said Graham. “It was wonderful to see the Lord build on the existing relationships that we had with the athletes and to be able to support them through adversity and joy,” said Jules. The opportunities Graham and Jules had at Gold Coast 2018 have proved a real springboard to the work supporting track and field athletes at Diamond League meetings this summer. Do join us in praying for more chances to serve at major sporting events in the future.